8vo, pp. 209, frontispiece portrait of the author plus 4 plates with photographic reproductions throughout the text. Buckram with gilt lettering to spine. 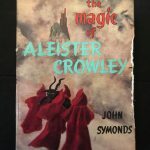 Original dust jacket lightly worn. 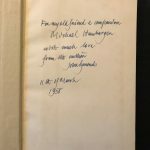 Inscribed by the author on front endpaper and dedicated to his friend scholar and poet Michael Hamburger: “For my old friend & companion / Michael Hamburger / with much love / form the author / John Symonds / 11th of March / 1958.” Hamburger accompanied Symonds to visit Aleister Crowley in Netherwood in 1947. Thus, this is an important association copy.